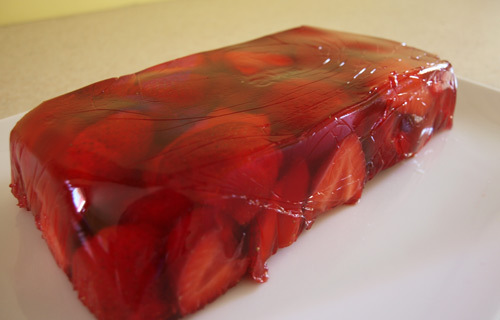 Now I know that Delia will be frowning and tutting at me, but I didn't make my own jelly for this, I took my inspiration from Delia's Summer Collection but also from her Cheat cookbook! So I used a Robertson's strawbery jelly and added sliced strawberries which had been quickly mascerated in a teaspoon of caster sugar and a squeeze of lime juice. Set that in a loaf tin lined with clingfilm and you have something quite impressive. I served it with Mango sorbet, not my own, and it was lovely and refereshing for a warm July day. It does look impressive. I'm enjoying sorbets in the summer weather too! I like the idea of a mango sorbet - even if it's not your own. There are times when cheating is definitely not frowned upon - it's an essential. This looks fabulous, Janice - and great idea with the mold. 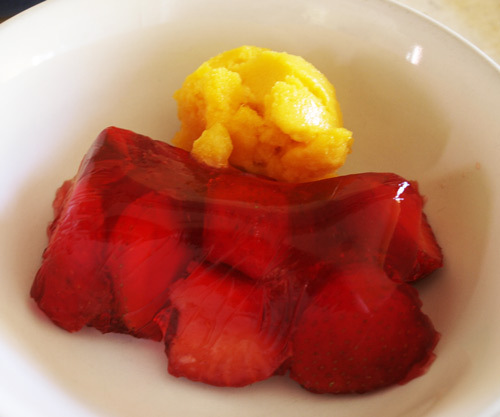 Used to be allowed to eat the odd cube of jelly when I was little as a treat. Never had it with real strawberries in though - nice idea. That looks so lovely and refreshing!